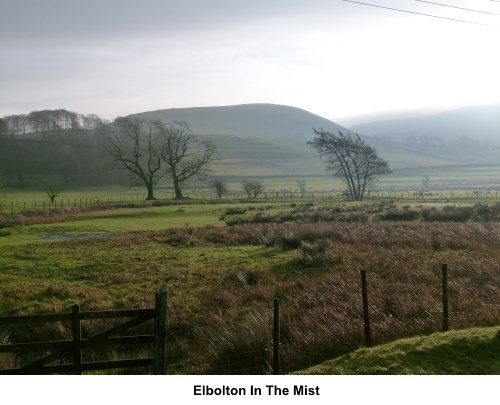 Introduction: Sounding like some sort of Spanish/Lancastrian hybrid, Elbolton is one of the low, round green hills which sit below the Rylstone Cross and Cracoe War Memorial ridge. These are the "Cracoe Reef Knolls" – remains of an ancient coral reef which formed in a shallow sea millions of years ago. 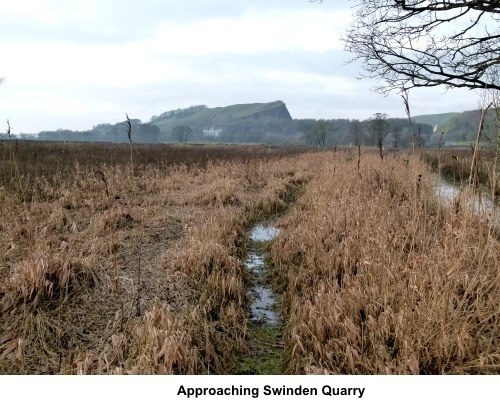 Their limestone content causes the grass to be generally greener than the surrounding area resulting in the hill having had mystical tales of fairies attached to it, presumably before people knew about chemistry/biology! 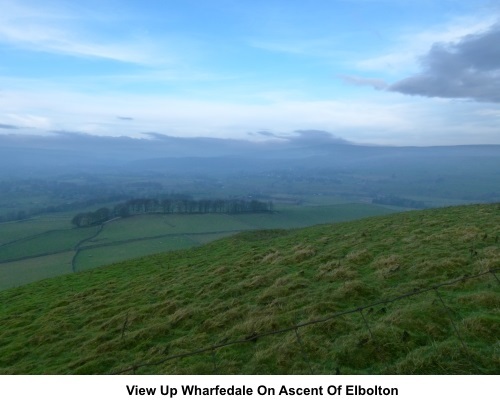 I did not see any magical creatures but on a clear day, there will obviously be magical views up Wharfedale and around from its 1142ft (348m) summit. Unfortunately I was not blessed with the most transparent of atmospheres but I hope the photos will give an idea of the potential. There is a cave on the hill where Neolithic and Bronze Age remains have been excavated but as this includes a dangerous drop, I did not venture there. No public footpath routes go over the hill itself but this part of the walk is Access land, so you are free to wander. 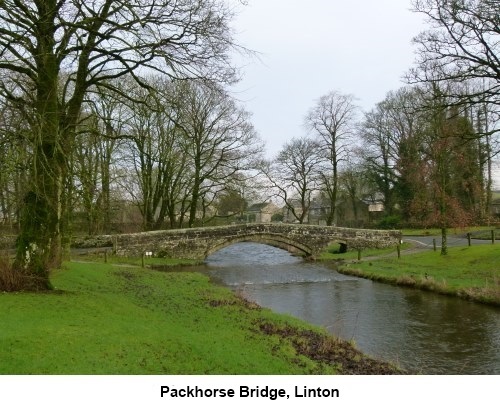 The walk starts from the village of Linton where there is a picturesque village green and the pretty “Little Emily’s Bridge”. This is a small packhorse type bridge on the original church path from Threshfield. It dates from the 14th century, and is thought to have been named after one Emily Norton, who took refuge nearby at the time of the Civil War. At the end of the green and a useful aiming point for the start of the walk is the imposing Fountaine's Hospital, alms houses and chapel, build at the explicit request of Richard Fountaine in 1721, to house the poor of the ancient parish of Linton. It is a listed building. 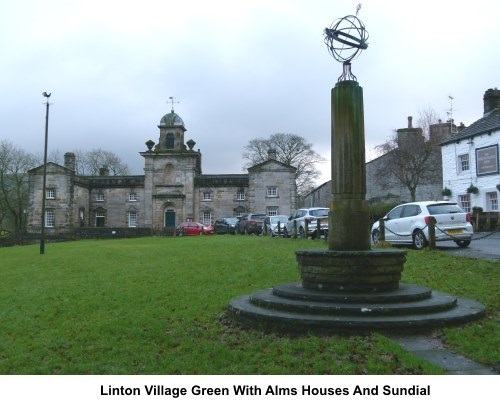 The walk starts at the village of Linton, where there is limited free on street parking by the village green. 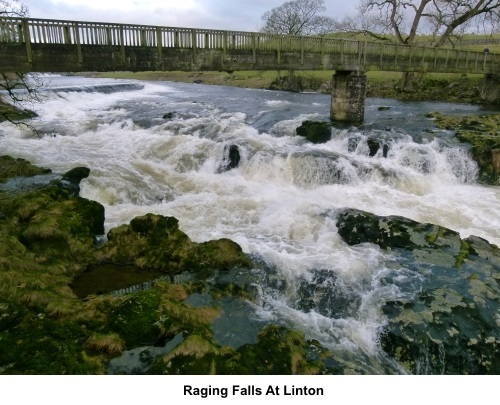 Linton is on the B6265, not far from Grassington. 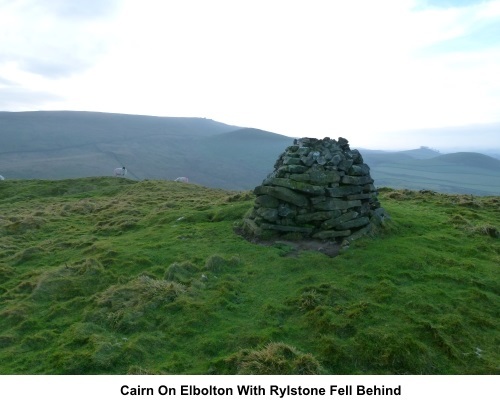 There is a collapsed stone wall on top of Elbolton where a selection of stones can provide a perch for a picnic. Start: Walk past the Fountaine Inn (SD 997628) (with it on your right) and at the end of the village green, pass to the right of the almshouses and Fern Cottage. Follow the broad walled track past the ivy covered barn, soon following a fingerpost for “Threapland ¾ mile”. At the end of the track, go through a gate and initially, follow the beck. 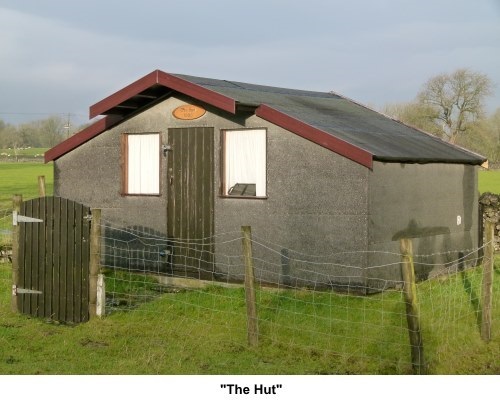 Pass “The Hut” a well kept weekend/holiday retreat. When the beck peels away from the footpath, follow the wall on the left. When it ends, cross a stile to follow a fence on the left. Go through a gated stile. Cross a concrete footbridge and continue to follow the left hand boundary to a stile which you cross to follow a public footpath fingerpost and now follow the right hand field boundary. Cross another stile and follow the direction of the fingerpost across an open rough field. At the far side, cross a wooden footbridge and continue to follow a fingerpost, heading towards the “cliff edge” of Swinden Quarry. Yellow paint on posts and gates indicate the way. As you get close to the quarry, look out for a walkers’ gate on the left (SD 985684). Go through this and follow the public footpath fingerpost and crossing Crook Beck. You quickly come to a fingerpost. Follow its direction across rough pasture to the opposite corner. Threpland House is ahead and just past it, look out for the public footpath fingerpost with a yellow top. Go right, through the gate and left along the tarmac track through the camp site (SD 985606). Follow this (ignoring a left pointing fingerpost), to Thorpe Lane and turn left along the road. 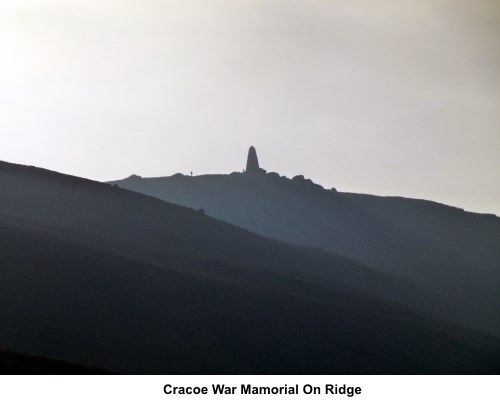 There are nice views along here of the Cracoe Reef Knolls and the Rylstone/Cracoe ridge. 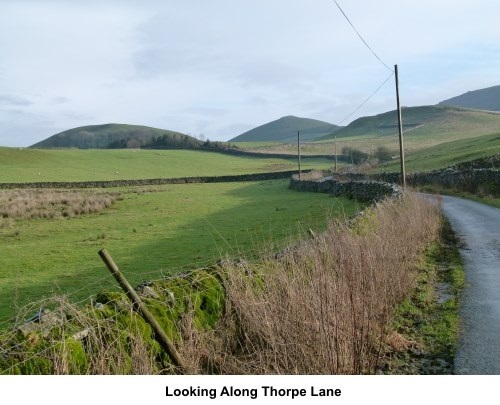 Follow Thorpe Lane for just under a mile and turn right, off the road, at Far Langerton, a stone house with barn attached, following a fingerpost for Thorpe (SD 997612). The route is marked with yellow paint, including a yellow painted gated stile across the field. Beyond this, keep straight ahead on the faint path to another gated stile. 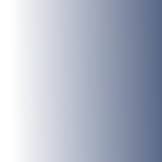 Continue in the same line beyond it. Arrive at two farm gates and go through the left one. Cross a stone step stile (SE 005613). 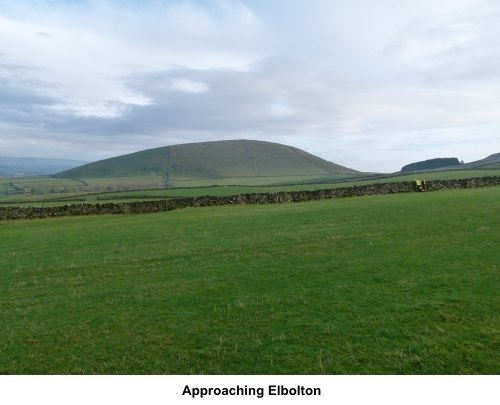 The direct route to Thorpe goes right, to circle anti-clockwise round the hill but to climb Elbolton, take the obvious green path heading up it to the left. When the more obvious path peters out, head right, to the top of the hill. The precise point you do this does not matter. You should arrive at the cairn on the summit (SE 007615). 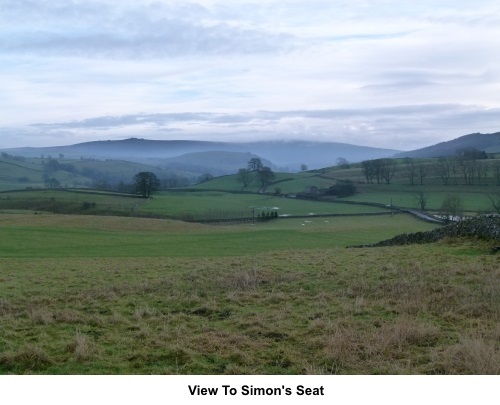 From here there are great views up Wharfedale, across the valley to Hebden Moor and to Simon’s Seat. It is now a case of continuing over the hill. I would recommend slightly right of the direction you approached the summit or around 161° magnetic on the compass, to avoid the steeper slopes. Descend to the obvious broad green path where you turn left to meet up with a wall. Follow its left hand side to a corner where through the gate, join a broad walled track. At the tarmac lane, turn left to the centre of Thorpe. You now have to decide your preferred route back to Linton. For a shorter walk of just over 5 miles, turn left at each of the two road junctions in Thorpe and about half a mile beyond the hamlet, take the second of two footpaths on the right. 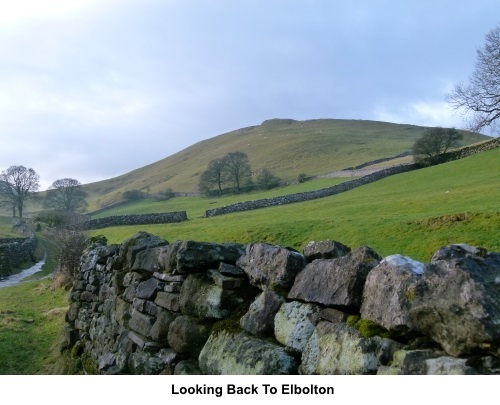 For a longer walk, you could go to Burnsall by following part of the directions for my Grassington to Appletreewick (via Thorpe) walk, from Thorpe, then returning via the river, a distance of about 9 miles. Alternatively you could follow the route I took on this occasion which was to turn right at the first road junction in Thorpe (SE 013618), to the right of the triangular village green and follow it to the junction with the B6160 (SE 019622). Cross straight over and follow the fingerpost for “Hebden ½ mile”. Follow the right hand boundary of a couple of fields then into a larger field. 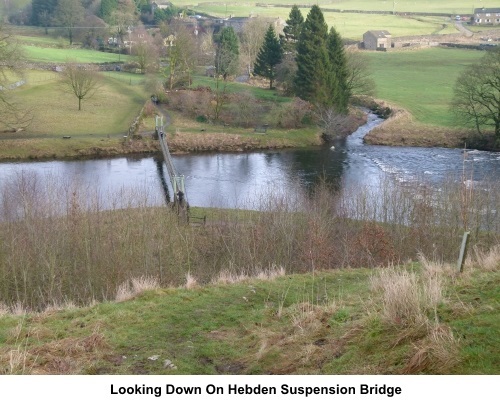 Walk straight across the centre and you will soon catch sight of the Hebden suspension bridge. Descend and cross this before turning left to follow the river back to Linton Falls. Cross the footbridge and follow the path through to the road. Turn right. Bear left at the first road junction then straight across at the cross roads from where Linton is a mere ¼ mile ahead.